What makes for a happy kitten? 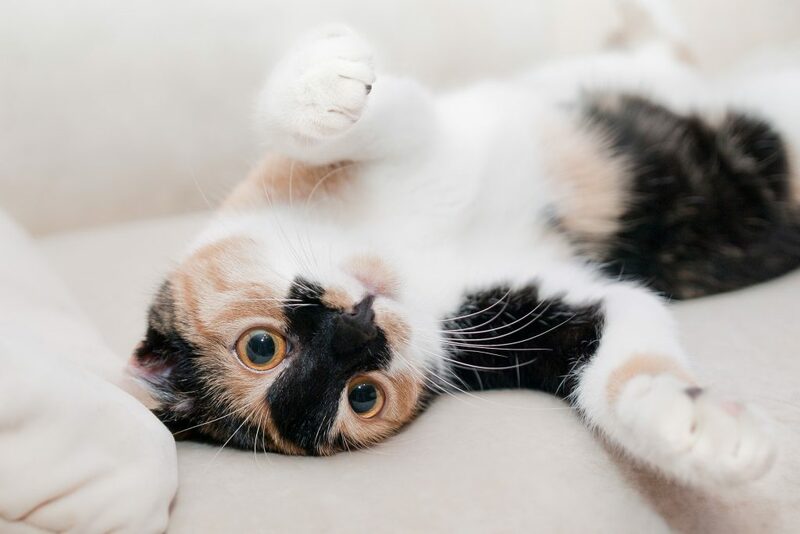 When you first brought your furry feline home, you might have noticed how excited she was about playing. Everything — from a flashlight to a fly — captivated her hunting instincts. But at the time you probably didn’t think about if or why cats need exercise. Maybe your cat is older now and prefers her sunny perch by the window to chasing fake mice. Or perhaps you’ve moved and now your once-outdoor kitty has to stay confined in the house. 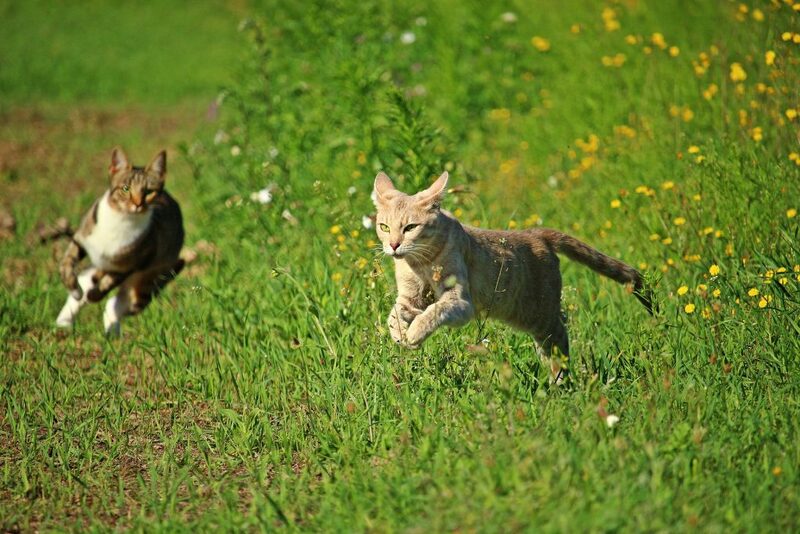 You might wonder if your cat needs more exercise, and if so, how to encourage it. Does My Cat Really Need Exercise? The short answer? Yes, of course. Just like most animals (with the exception, perhaps, of the sloth), cats need exercise to stay fit and healthy. The secret to a happy kitten? Exercise! According to a study from the Association for Pet Obesity Prevention, some 57% of cats in the United States are overweight: Yikes! That’s a lot of really fat cats. And many of them are actually obese cats. Side effects of feline obesity include everything from arthritis to liver problems to urinary tract disease. So how can you get your cat to lose weight? We have more details here, but in short, if you want your kitty to live all nine lives, you need to encourage her to stretch those legs. How Long Should My Cat Play Daily? The more, the better (a cat is unlikely to overdo it — he’ll stop when he’s gone from a happy cat to a way-too tired cat). Somewhere between a half hour and hour each day is best for your cat’s overall health and well-being. This doesn’t all need to be supervised play (as in, you are playing with her), but you should keep a general tab of how long your cat spends moving vs. basking in the sun. If you know your cat isn’t likely to play on his own, you should make a concerted effort to entertain him for at least 15 or 20 minutes a day, if not more. Put yourself in his paws: Cats are instinctual hunters, so cater to that innate need to stalk and capture. What do cats like to play with? Prey. 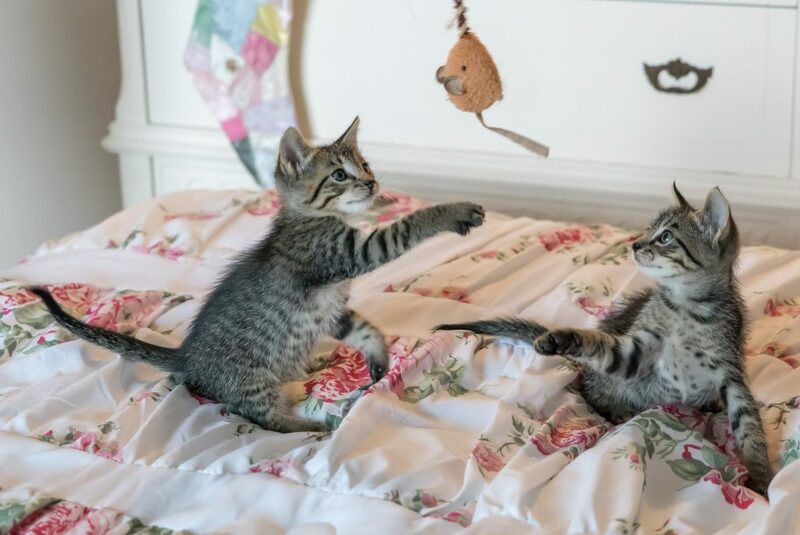 But before you gag at the idea of dead mice in your living room, remember that there are all kinds of motorized cat toys, fake fuzzy mice and feathers-on-string that mimic prey without the yuck-factor. Hide the mice around the house, kick or toss them in your cat’s direction, or dangle that feather near his face. Have a laser pointer or a small flashlight? In a dimmed room, trace patterns on the walls (or better yet, your cat gym!) and encourage her to “catch” it. 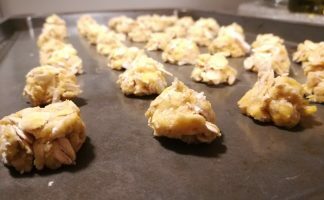 If you haven’t tried this before, you are missing out! Older cats might not be fooled by the “hand under a blanket” trick, but one of my kittens used to go crazy chasing the mysterious beast beneath the covers. And it might be cliche, but go grab a ball of yarn and see what happens. 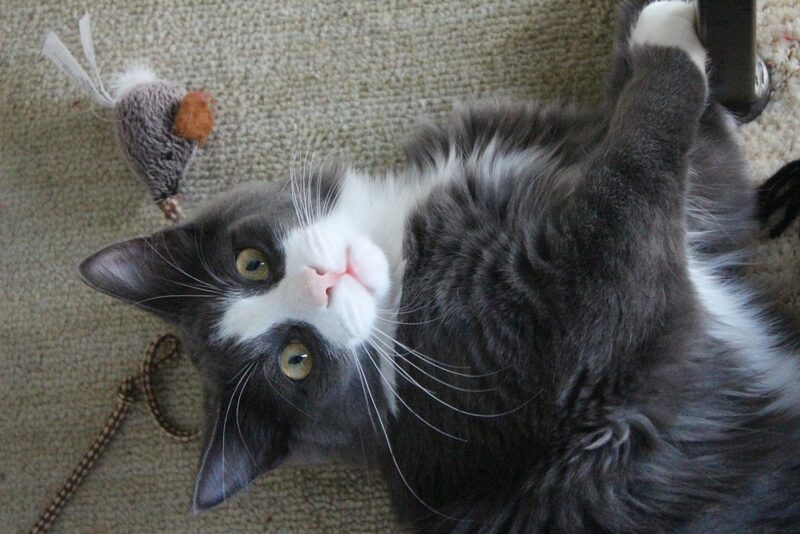 Not all cats are interested by the same toys and games, so try a little bit of everything until something clicks. What About When I’m Not Home? Most of those exercises require you to be home to facilitate play. What about when you are at work? For starters, invest in some kind of cat tree or cat climbing tower so your kitty has incentive to jump and climb vertically, even just to take a nap. A scratching post is another awesome investment to give your cat a way to expend energy. 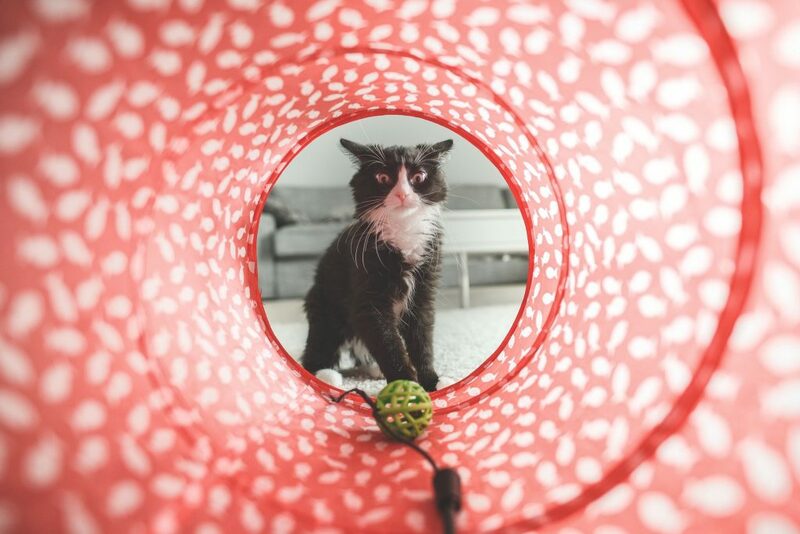 If you want to get really fancy, purchase a type of “cat treadmill,” also known as a cat running wheel, that would let your cat run and run for hours even with limited indoor square footage. 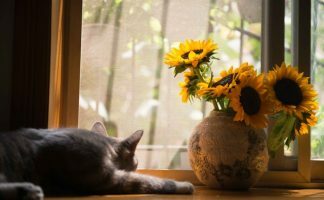 Next, consider investing in a fish tank (that your cat can’t jump into, of course) or a bird feeder to put outside your cat’s favorite window. He might spend a few minutes every day pacing back and forth, stalking the fish and birds. 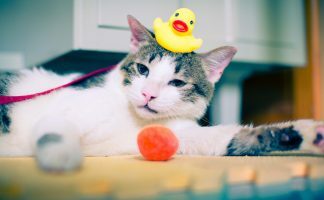 Additionally, leave treats on the highest perches on your cat tree, fill a toy with catnip (he’ll go nuts and then crash from his high) or invest in spring-loaded toys that allow cats to swat even while you’re away. Of course, when you get home make an effort to engage your cat(s) one on one to make up for any exercise they didn’t do willingly while you were at work. Most obese cats are indoor cats. 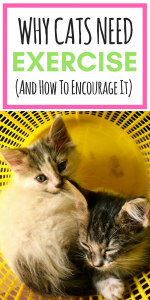 I shared some ways to keep your cat fit inside your home (like the cat exercise wheel), but if possible, allow your cat to get outside from time to time: The outdoors is the ultimate treadmill for cats! Cats don’t need to sleep under the stars to enjoy the outdoors. Just let yours out for an hour or two while you are home, and use treats to lure him back inside for bed time. If you live in an apartment, or somewhere it’s not safe to let your cat roam wild, consider a cat harness. I know, it sounds like trouble, but you never know! A kitten, in particular, might consent to wearing the ridiculous device. Conclusion? Play With Your Cats! Now you know how to exercise your cats, and how important it is that felines get adequate exercise. One of the easiest ways to ensure they are up and moving is to play with them whenever you can. So what are you waiting for? Find some new fun toys (or un-bury the ones they loved in kittenhood) and get playing! There’s all kinds of exercise for cats!